Ahead: BAD SCIENCE, characters who go off the rails, and a good premise. The first half of Breathe was really rather good. Sarah Crossan bounced back and forth between three well-developed characters - all teens, but all radically different. There's the cold resistance member who seems horrid, but is really just trying to stay alive. The scholarship girl who is brilliant but will never get anywhere because of her birth. And the rich-but-mostly-kindhearted boy who doesn't stand up to the system, but doesn't lie down in front of it either. Three kids who are pretty much on their own, and who all learn to fight the status quo in their own way. As I said, pretty good stuff - and while I wasn't over the moon about the characters, I could see myself starting to connect with them. 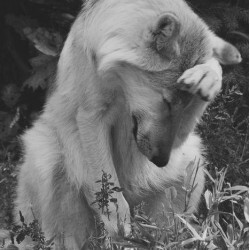 But then, about half way through the book, things started going downhill. The chapters started getting shorter, yet covered twice as much action. Characters were introduced who were supposed to be leaders but were genuinely psychotic - but no one dealt with or acknowledged this. And badda-bang instalove! I was kinda shocked. But it was about to get worse... bring in the bad science. OK, I understand that most people are not scientists - but there were mistakes in this book that were the equivalent of writing, "the island of France" or "Earth's second moon". Things so blindly obvious, someone should have noticed them. I don't necessarily think Sarah Crossan should have been responsible for spotting her scientific faux-pas, but someone. Anyone. *Minor Spoilers* For those of you who are doubting me, here's an example. 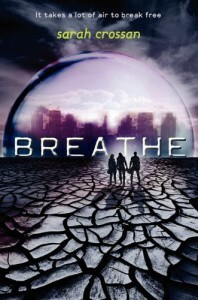 Breathe describes a world where, as the oxygen levels decrease, people start dropping like flies. Suddenly, graveyards are full, mass burial sites aren't enough, so... people start burning the bodies. *head desk* You cannot burn people in a low oxygen environment!! Flames need oxygen!! Human bodies are not super combustible! It's basic chemistry that we worked out in the stone age. I told two people this specific example, and both of them spotted the mistake immediately. Why didn't an editor? I can only pray that that line did get cut from the final version... but doubt it. *Even More Spoilery* Another thing that made no scientific sense whatsoever was the rebel's miraculous ability to breathe in a low oxygen atmosphere. It's true that people who live in high-altitude areas develop higher red blood cell counts and can cope in less oxygenated atmospheres... but not the 6% oxygen levels of Breathe. This becomes even more unbelievable when you find out that all the rebels had to do to breathe like this was practice and throw in a few meditation sessions. So, after all that, am I going to read the sequel Resist? Probably. I know that Sarah Crossan is capable of writing a good book - there's half of one right here in Breathe.